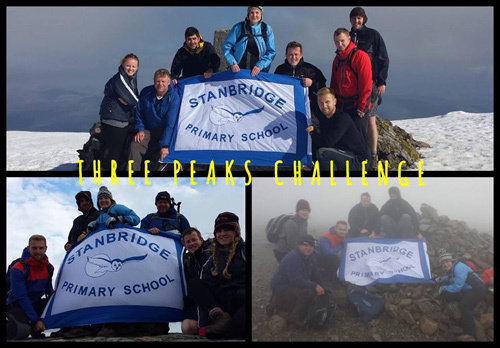 A TEAM from Stanbridge Primary School has risen literally and magnificently to the challenge of scaling Scotland, England and Wales’s highest peaks in just over 24 hours. The ten returned with tales to tell the children at the Downend school – as well as raising hundreds of pounds for Stanbridge’s library. The group that took on the ascents of Ben Nevis, Scafell Pike and Snowdon in May included head Faye Bertham and her deputy Mark Williams with teachers Andy McGovern and Mike Preedy, sports coaches Lewis Fishlock and Chris Gardner and friends of the school Leonie Dyer and Colin Dyer. They were supported by teacher Elinor Lazenby and driven by Mr Gardner’s Dad Philip. The adventure began with a lengthy drive to Fort William and a short night in a youth hostel before a 6am start on Ben Nevis for an ascent that took two and half hours. After unfurling the school banner at the snowy summit, the group descended for a six-hour drive to the Lake District. They tackled Scafell Pike in the dark and had to endure fog, cold and wind – but they made it. With aching limbs, they journeyed through the night to north Wales and started climbing Snowdon at 5am. The views from the top were stunning but the wind was bitter and team members were glad to complete their mission. Their final statistics were three mountains, 56,450 steps, 6051 calories, 1300 miles all in 26 hours and 15 minutes.